PrizmDoc 13.1 now supports Document Compare feature for Linux platforms. It is important to note that the Microsoft Word document comparison feature uses the Microsoft Office Conversion (MSO) add-on option for PrizmDoc Server running on Windows and therefore requires the PrizmDoc Server running on Linux to be configured to connect to PrizmDoc Server running on Windows. Content Conversion Service (CCS) now provides the ability to perform optical character recognition (OCR) to convert a raster file or a scanned PDF file to a searchable PDF document. The resulting PDF document will contain the original image and the recognized text in a separate invisible layer, with each text character position matching its image counterpart. This will allow you to search, select and copy the text in the resulting PDF document. 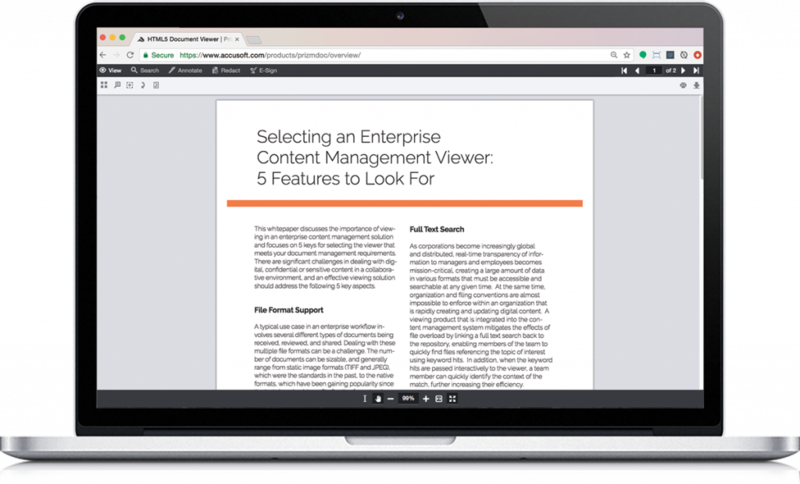 The Content Conversion Service's feature that performs OCR (to convert a raster file to a searchable PDF document) does not support CentOS 6 and Red Hat Enterprise Linux 6 platforms. PrizmDoc 13.1 introduces rendering updates for the Date and Time header fields of MSG and EML files with the corresponding time zone. When an end user views emails in the PrizmDoc Viewer, they will be able to see what time zone the date and time correspond to. 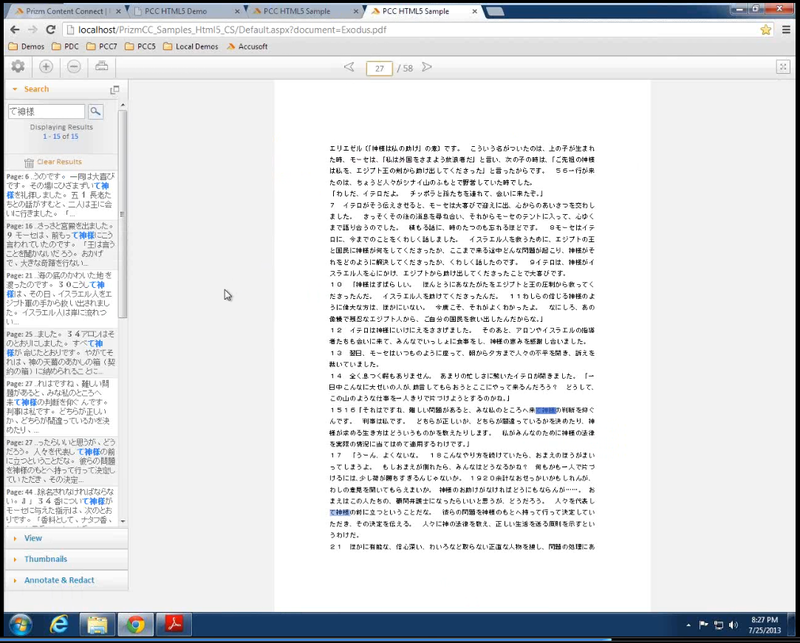 First page of content in the Viewer loads faster now, especially for large Microsoft Office documents. 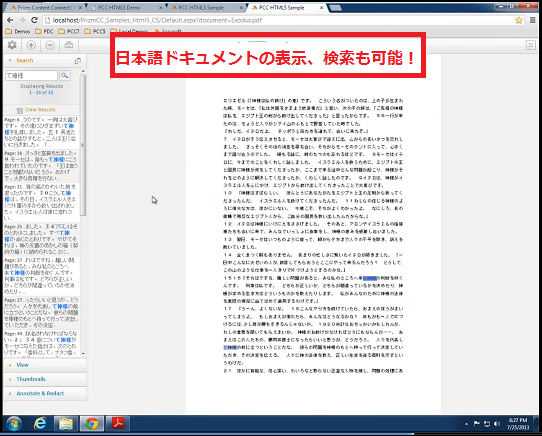 Page content loads more quickly when scrolling through a document in the Viewer. Eliminated the occasional slowness in getting document text. The Viewer touch experience (for phones, tablets, and other touch devices) has been improved with product updates and behavioral improvements. 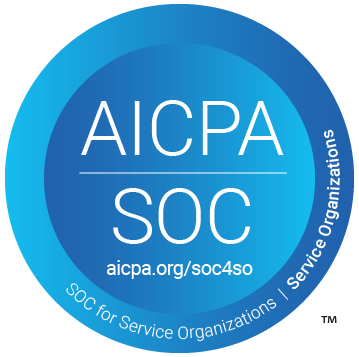 PrizmDoc Application Services now supports Amazon S3 for storage of all of its artifacts, including viewing packages and annotation layers. Added a system check to verify requirements before installing the PrizmDoc Server. If your machine doesn't meet the minimum requirements, a warning message will be displayed indicating that you may experience poor performance. Improved viewing experience for Excel worksheets by rendering Excel gridlines, headers, footers, and hidden content by default. Improved email rendering fidelity (by maintaining the HTML formatting) when viewing MS Outlook MSG files with HTML message body. Significantly improved conversion and viewing performance of large Excel documents.